I decorated a lemon tart with lime and lime zest for St. Patrick’s Day. That was last year. ST. PATRICK’S DAY IS A BIG HOLIDAY IN MY FAMILY — and not because we’re Irish or even big beer drinkers. It’s because my father, Eric Sonneman, a refugee from Nazi Germany, arrived in this country on March 17, 1939. He was 28 years old. When his ship arrived in New York on St. Patrick’s Day, the passengers were greeted by a band playing Irish music at the pier. My father knew nothing about St. Patrick’s Day, but his uncle, a recent immigrant himself who had met my father’s ship, insisted on going to Fifth Avenue to see the fabulous parade. Now I always celebrate St. Patrick’s Day as a day to remember my dad’s wonderful introduction to America. The traditional food for the day, of course, is corned beef and cabbage, but that has never appealed to me. Something-or-other green (and a little Guinness stout) is enough for me. Last year I was fancy with the decorated lemon tart, but this year I’m lazier, and I’m just making my bright-green parsley soup (the recipe is here, though I now use my hand-blender) and some oatmeal-currant scones. It’s my own little St. Pat’s tradition. Anything green will do, though — even a green salad! The important thing is the toast. I’ll be toasting my dad and the country that welcomed him. My family always celebrates the day, and I’ve come to think of it as a kind of holiday to celebrate immigration. It has never meant more to me than this year, because last fall I went to Mannheim, Germany, the city where my father and his family lived, and attended a commemoration of the deportation of Jews from the southwestern region of Germany (Baden) to a concentration camp in France on October 22, 1940. Fortunately my father had the foresight to get out of Germany before it was too late, and the great luck to come to America — and that is something to celebrate. So what would I make (besides more of those filo pastries) to go with a bubbly beverage or two? I am not a great fan of the “traditional” corned beef and cabbage (my father had corned beef on rye, which was much better!). Since I hadn’t made a pie for last Saturday’s PI Day I decided to make a lemon tart. It’s so rich that I rarely make it. . . but what better occasion than this? Now, if I just can find something green to decorate it. 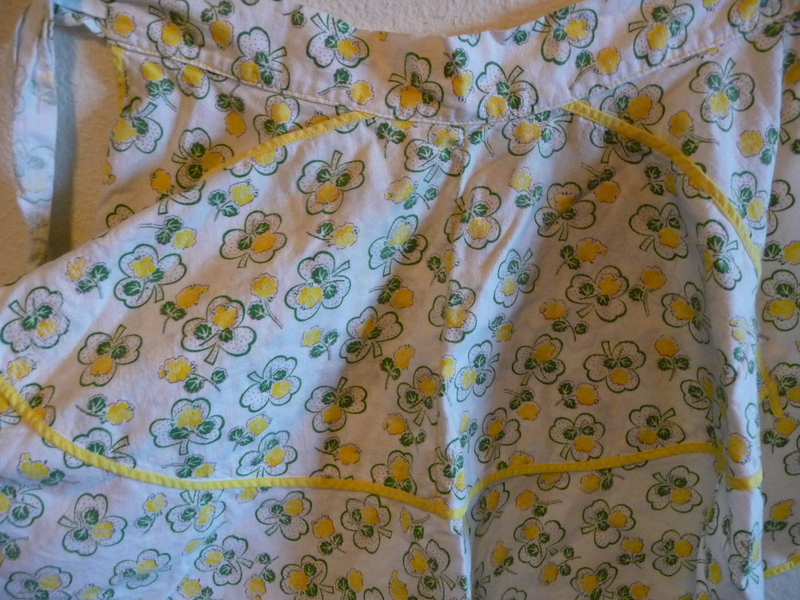 . .
First you make the lemon curd. This is not a traditional method of making lemon curd, but it is foolproof — as long as you keep stirring and don’t let it boil. 1. Cream the sugar and butter together with an electric mixer until smooth, then add eggs and egg yolks and beat again. 2. Mix in the lemon juice. 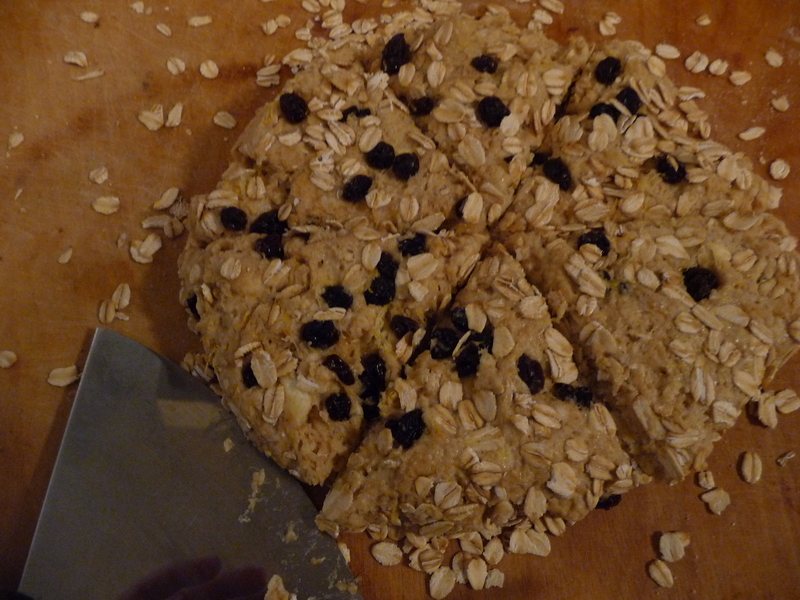 The mixture will look curdled, but don’t worry — it will come back together when heated. 3. Put the mixture in a medium saucepan and heat over moderately low heat, stirring constantly. Do not let the mixture boil. 4. Cook until thickened — when the mixture coats the back of a wooden spoon. This will take about 10 to 15 minutes (or maybe a little less). 5. Take the mixture off the heat, and stir in the lemon zest. Let the curd cool, stirring every once in awhile to prevent a skin from forming. Store in a covered container in the refrigerator until ready to use. This pastry shell for the tart is an easy pat-in-the-pan version. 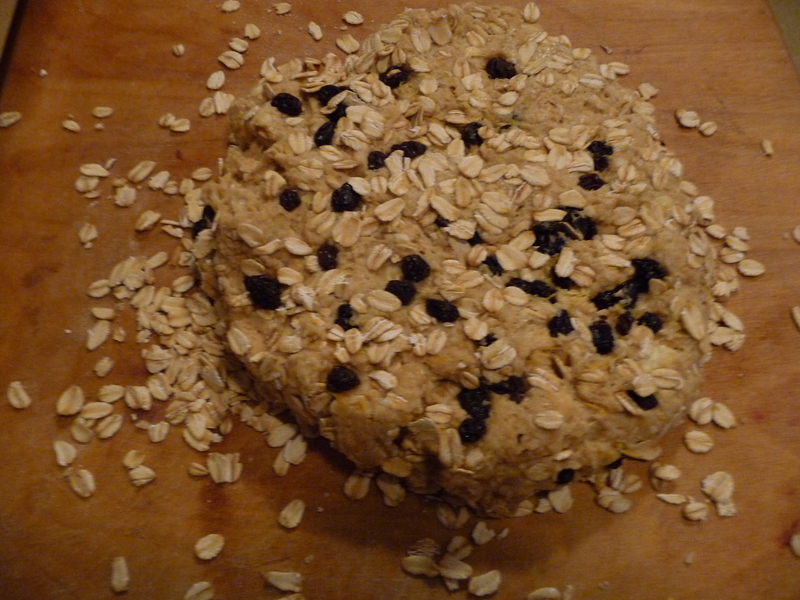 Add enough flour to form a smooth, soft dough. Place dough in center of tart pan and press evenly on bottom and sides. Place tart pan in the center of the oven and bake until dough is firm and lightly browned, 12 to 15 minutes. Remove from the oven and let cool at least 10 minutes before filling. 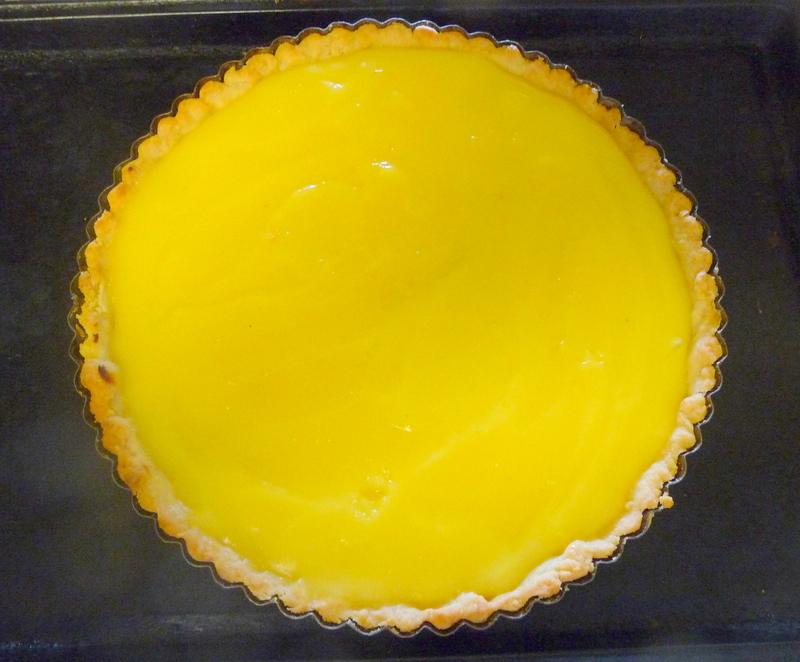 Fill the tart with cooled lemon curd (you may have a little leftover, which is nice for other things, and will keep well in the freezer). Put tart in the middle of an oven preheated to 325 degrees. Bake 15 minutes. Remove to a wire rack and let cool. Refrigerate well before serving. If you have fresh berries, they’re nice for decoration. Seventy-five years ago, my father arrived in America, having escaped Nazi Germany. Please read more of the story here, published online in Tablet Magazine. I don’t make anything fancy for the day (though I have been known to make S-cookies with green sparkling sugar) and I’m not a corned-beef-and-cabbage fan, so I’ll probably just make a variation of my emerald green parsley soup (thought I’d add some leeks to it this time) along with some Irish soda bread or maybe oatmeal scones. And if there’s a beer around (it could be root beer or ginger beer or practically anything) I’ll make a toast to my dad and all those who helped him and his family come to America. If not for St. Patrick’s Day coming up (a celebration in my family, which I wrote about here), mid-March would be kind of bleak, noted for the Ides of March (the occasion of Julius Caesar’s assassination). It’s an in-between season, neither winter or spring. 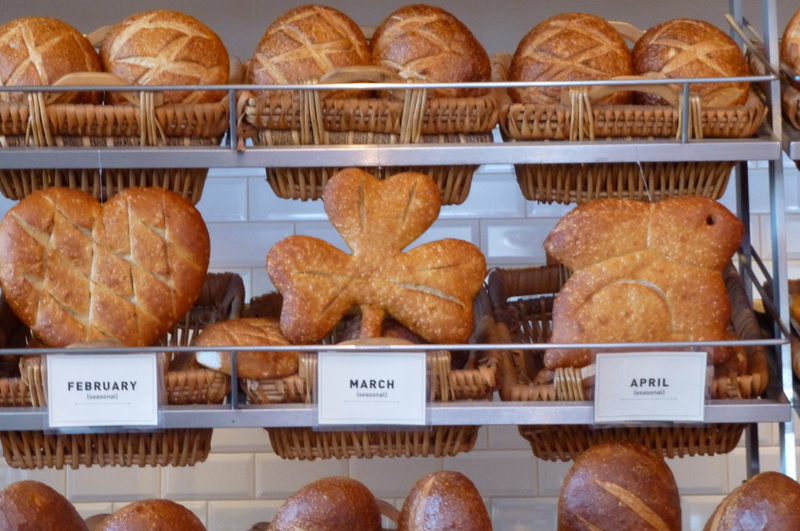 It is still rainy and blustery here, still a time to enjoy pots of soup accompanied by crusty bread. But there are those times when you run out of bread and wish for some nice heart-warming baked goods you could whip up and take out of the oven in just about half an hour from the time you thought of it. I’m here to tell you it can be done! 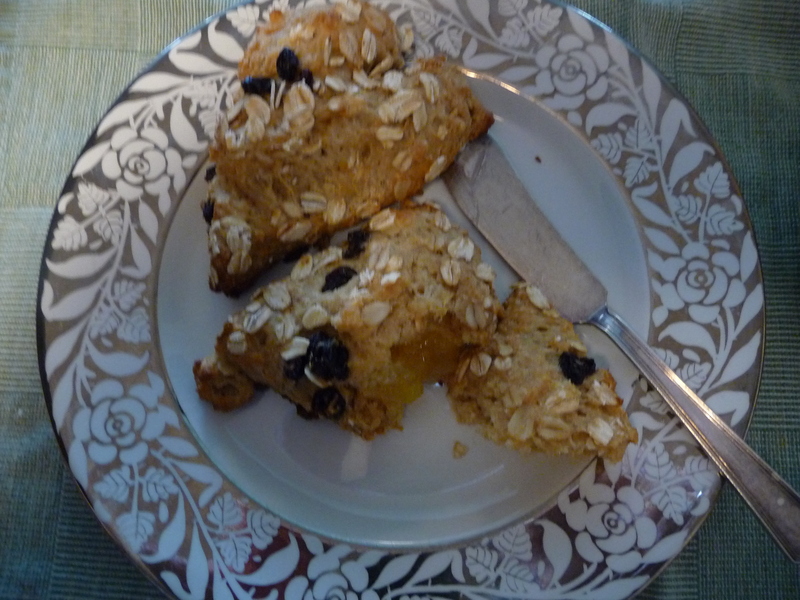 This afternoon the idea of oatmeal scones materialized into a plateful of them so quickly that Steve could hardly believe it. Set the oven to 425 degrees now, and you can be eating them soon. 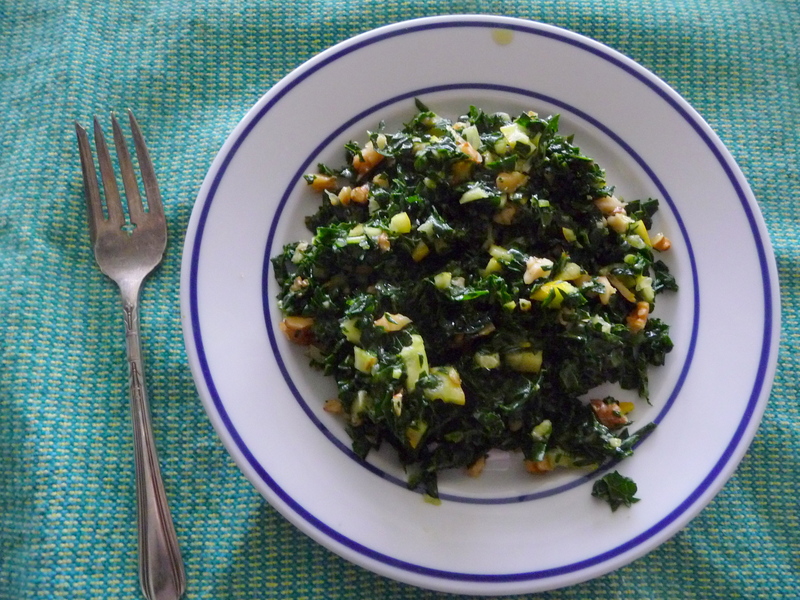 If you’re in the St. Patrick’s Day spirit, serve them with something green –perhaps Anna Thomas’ green soup, a skillet full of sauteed chard or kale with some garlic and lemon, or maybe a chopped kale-lemon-walnut salad like the one I made today. For the salad, finely chop a bunch of lacinato kale and one medium organic (or unwaxed) lemon, skin and all. Add a quarter cup of chopped toasted walnuts. (Some chopped apple would be good in this too. Or some dried cranberries.) Sprinkle with salt and drizzle in as much olive oil as you like, perhaps adding more lemon juice (stir in half a teaspoon of honey if it’s too sour for you). Very healthy! Now would you like that scone recipe? I’ve kept the recipe small-ish (6 scones) because these really are best fresh. But if you’d like to make a dozen, it’s no problem at all to double the recipe. In a separate bowl or large measuring cup, mix the egg and yogurt together, then add to the dry ingredients, mixing only until it comes together into a soft dough. Put the wedges on a baking sheet and bake for about 12 minutes, till golden. Serve them warm. 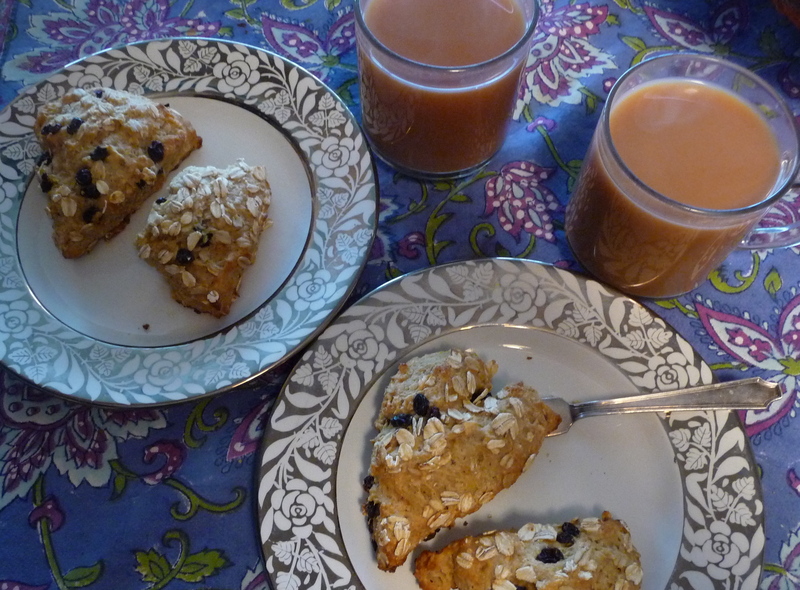 On any day of the year, these scones will go well with both savories and sweets, from breakfast to coffee or tea time to dinner. 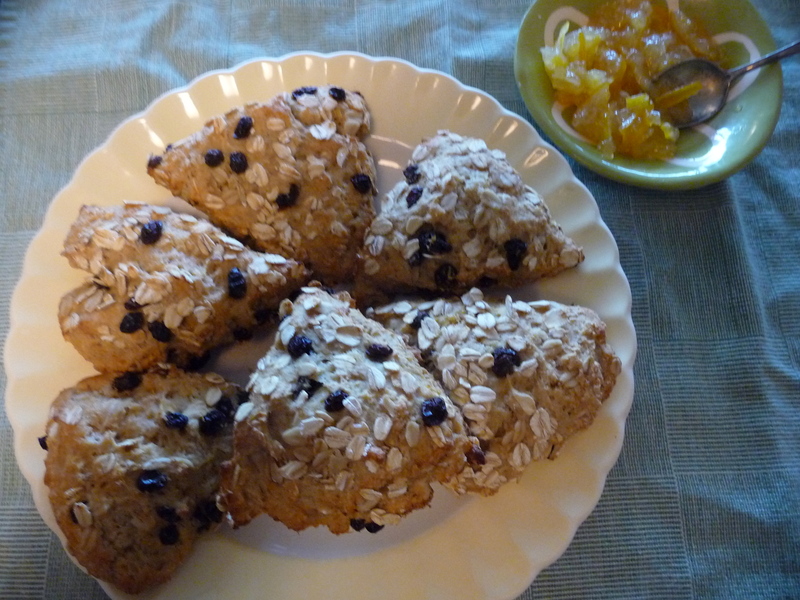 I must say these scones were delicious with lemon marmalade, accompanied by a strong cup of Irish Breakfast tea. They lifted my spirits, chased away the March blues, and almost made me forget the tea was decaf! My family always celebrates St. Patrick’s Day. It’s not that our Jewish family has any Irish ancestry. But my father always talked about the “Irish luck” that allowed him to escape Nazi Germany and arrive in the United States on March 17, 1939. 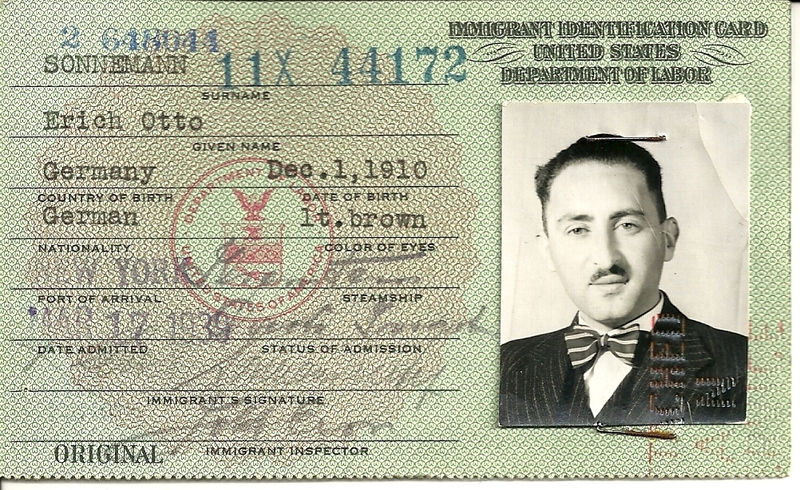 After he’d made the decision to leave–in 1936, when he lost his job after his boss was ordered to dismiss all Jewish employees–it took years and many obstacles before he could obtain a visa to America. By that time, February, 1939, there were no more boats leaving Germany. He packed a few belongings in a brown steamer trunk, said goodbye to his parents and brother, and took a train to Holland. In early March, he boarded a small ship bound for America. Because of rough seas, the voyage lasted fourteen days and the ship arrived in New York on March 17, 1939 – St. Patrick’s Day. A band playing Irish music greeted the ship at the dock, and my dad’s uncle, who had emigrated previously, took my father to Fifth Avenue so they could see the spectacular parade. My father had never heard of St. Patrick’s Day and was so astonished by the joyous atmosphere of his arrival that he never forgot it. “I thought this is a wonderful country, to welcome the immigrants with a band and a parade!” he always said. 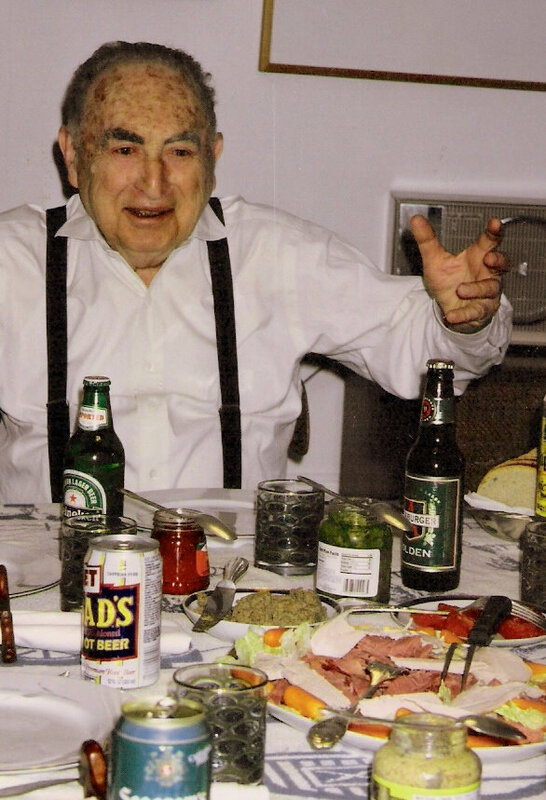 My dad had a party every year on March 17, which usually included corned beef sandwiches (on Jewish rye), root beer and beer. 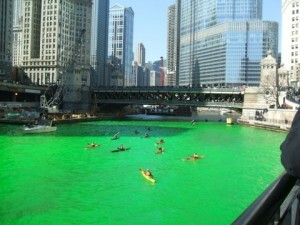 And we’d go downtown in Chicago to see the parade and the river dyed green (yes, really). Since my dad’s no longer with us, my St. Pat’s Day traditions are not so grand. I simply honor the day by wearing green and eating green food. 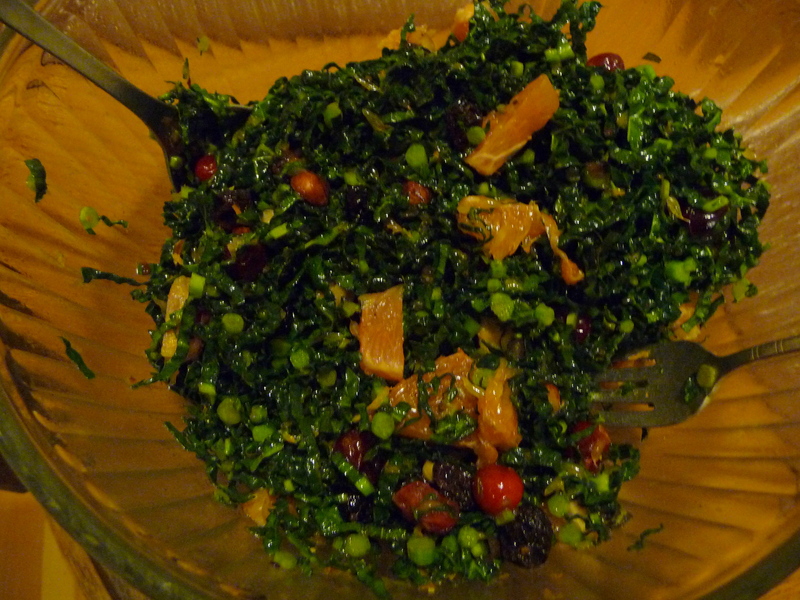 It could be a gloriously green kale salad, which Cathy introduced me to…. To make kale salad, just wash the kale, cut out the tough stems and shred or finely chop the kale. Make a salad dressing (one I like has oil, sesame oil, rice vinegar, and a little soy and honey) and let the kale sit in the dressing for an hour or more. Add some other good things — dried cranberries, orange or apple slices, sesame seeds, hazelnuts– whatever you like. 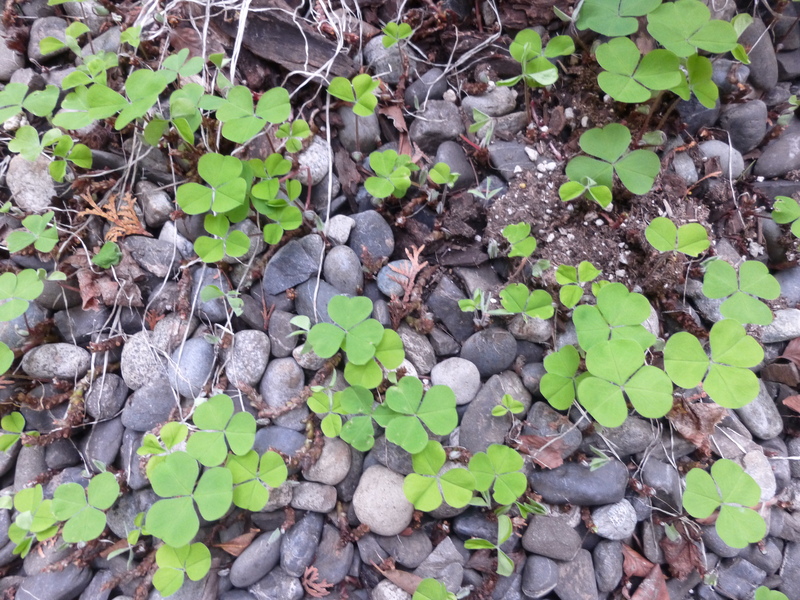 I love the way my father saw St. Pat’s Day as a kind of immigrants’ day. In my own small way–even if it’s just by eating green food– I want to honor the joy and and celebration my dad felt remembering his welcome to America. For me, that’s what the day is all about. The soup that got me through graduate school and a lot of other stressful times is a cheery green soup — Parsley Soup. The beauty of this soup is that it’s fast and simple to make. And nutritious. Plus, you can find any of its humble ingredients–parsley, potatoes, onions–at the grocery store, all year long, and they are cheap. More than a decade ago, when I was a middle-aged mother, teacher and returning student with homework and budget to worry about, coming up with a healthy homemade dinner for my daughter and myself was a challenge–and this was often the solution, especially in winter. Along with some good bread, or maybe (if I had the energy) some homemade popovers or biscuits, and a slice or two of cheese — the green soup not only made a good meal but restored my equilibrium. By now it’s an old reliable. Parsley, usually relegated to a minor decorative role, is an unexpected star in this soup. Either flat or curly parsley works well. My friend Peggy told me about this soup years ago — her version had no onions, but a lot of butter. (It called for 8 potatoes, 2 cups of chopped parsley and 1/2 cup of butter.) My variation doesn’t require butter (or cream, for that matter) — it’s one of those so-called “cream” soups that is creamy thanks to the magic of the handy dandy blender. First of all, you simply boil some potatoes. Three or four will be good for a smaller pot of soup; you may want to double this if you’re feeding four or more folks. Next, you’re going to take one or two bunches of parsley (washed) and chop them up so you have about a cup of chopped parsley. You don’t have to be too precise about the chopping, since you’re going to put this in the blender anyway. Some people like to use the stems, which are perfectly edible but are too fibrous to really blend into the soup. I usually don’t use the stems. Oh, you’re also going to chop up a medium onion. And some garlic cloves, if you like. 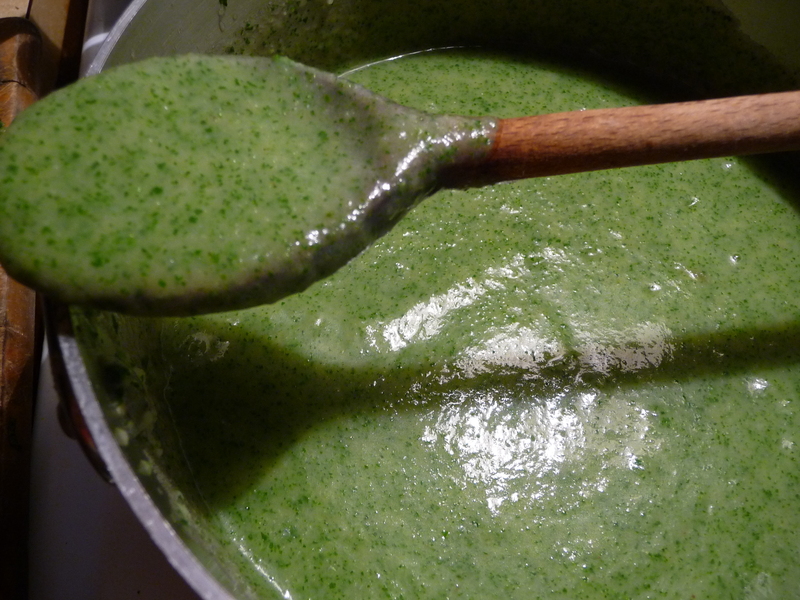 Back to the parsley soup: You can use oil or butter or a combination to saute the onions until soft, then toss in the garlic for a minute, and then add the chopped parsley. Sauteeing the parsley seals in that nice bright green color. Just do this until the parsley kind of wilts and is a little soft. Now it’s time for the blender. Put the parsley-onion mixture in first, and add a couple cups of liquid — water or a light vegetable broth is best, in my opinion (a stronger broth might overwhelm the delicate flavor of the parsley). Or you could add some milk, if you want it to be creamier (and have some protein). Blend it up until it’s the texture you like. Then add in your peeled, boiled potatoes, roughly chopped, and blend again. You don’t want to blend potatoes very long, or they will develop a weird texture. If your blender doesn’t fit all of your soup at once, just pour some of the blended mixture into a pot, add some more liquid, and put in the rest of the potatoes… Again, remember not to over-blend those potatoes — don’t leave the blender running while you do something else! Pour the whole concoction into a pot and add more liquid till it’s as thick or thin as you like. At this point, you may want to use milk or even cream if your arteries can tolerate that — but water or broth will also do just fine. Heat the soup gently and don’t let it boil away, especially if you have any milk in it. Season with salt (generously if you just used water), pepper, and some gratings of nutmeg, or with whatever seasonings you like. Maybe mint or sage, a touch of chipotle powder or cumin? Maybe add some cilantro to the parsley? Whatever you like, the potato-parsley mix makes a good base to take off on (though it might be a good idea to go easy on the seasonings, if you like the taste of parsley). I also make this soup for Saint Patrick's Day! Many years ago, I sent my recipe for parsley soup to Anna Thomas, of the Vegetarian Epicure cookbooks (Bless her for introducing 1970s America to fine vegetarian cooking! I have a collection of her books and use “The New Vegetarian Epicure” lots. Roasted vegetables, mmmmm. Here’s an article about her from the L.A. Times) She posted her own variation of parsley soup on her Web site, and included it in her new book, “Love Soup.” Her soup is pretty different from mine, but then mine is pretty different from the one I got from Peggy. Many potato soups or squash soups take well to this blender method. On the Vegetarian Epicure site, you can see a short video of Anna making “roasted turnip and winter squash soup.” Again, you could simplify and adapt that soup any way you like. You can easily make this or any soup your own. — and you’ll soon be on your way to a low-stress, hearty soup to soothe the soul. Subscribe to toby's kitchen notes. Smitten Kitchen: Everybody loves this food blog, for good reason.